You know that feeling of being in high school and finally being invited to the cool kid's party? Me either ;) but I imagine it's a little like being asked to participate in the Sewing Block Party- all my favorite bloggers and sewists are sewing Petit a Petit patterns and sharing this month. It's going to be (and already is!) loaded with inspirational kid sewing featuring Celina's fantastic patterns. These ladies have mad skills and impeccable style, so I'm humbled and grateful to be invited along for the ride! If you like sewing or kids clothes (and I'm guessing you do if you're here...) then don't miss the links to the other bloggers at the bottom of this post! There's also a GIVEAWAY of a copy of ALL Petit a Petit patterns, linked at the bottom as well. 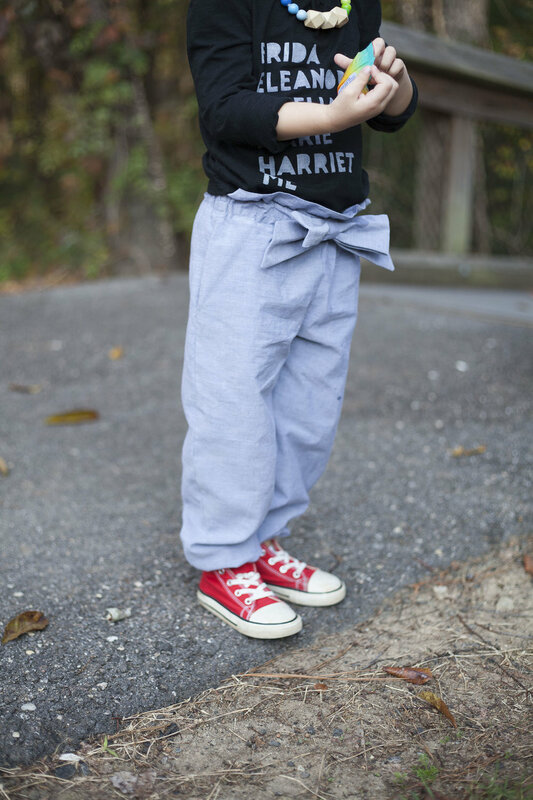 In the mean time, you can use promo code BLOCKPARTY in the Petit a Petit shop for 20% off all patterns. Phew, what a party, right?! I have a list of at least 4 projects I'm hoping to sew up using Petit a Petit patterns in the near future, but for this post I chose to sew up the pants version of the Ash jumpsuit. One of the fantastic things about Celina's patterns is that they're a bit like a choose your own adventure book. They have lots of options and variations to make it exactly what you want. The Ash pattern is really like 5 patterns in one! You may remember in our sewing for kindergarten planning that Charly and I made a Pinterest Board. I'd hoped to replicate these pants for her, and saw potential in the Ash pattern to do just that. I was able to hack the Ash pattern to achieve a similar look with just a few small changes! As you may have noticed, Charly isn't modeling this. She's very particular about things like fit and feel, and she felt these were too baggy, so her (slightly smaller) little sister got them! Charly loved the look of them but she's used to wearing leggings or skinny jeans. She hasn't worn non-stretchy pants...maybe ever...so she just wasn't on board with the fit of these. She also refused to wear some cute joggers I got her from Target, so I should have anticipated her response. I, however, thought the fit was fantastic. Just enough ease through the hip to make them easy to play in without looking baggy. The details about sizing are below, but I anticipate Caroline will grow into these nicely by spring time. They have nearly the same waist measurement and just a few inches difference in height. She's catching up to her sister quickly! -Her measurements above put her in a size 2 with length of size 4. As mentioned, I sewed these for her sister originally, so these fit a bit wider/longer than they're meant to. I did remove about an inch of length and tapered from knee to hem, removing 1in of width on each side at the hem, in an effort to appease the picky older child. -cut the waistband with double height to allow room for the ruffle at the top. I sewed the waistband as indicated on the pattern, except I sewed a line of stitching 1 1/8in from the fold of the ruffle to create a channel for the elastic. The shirt is purchased from Target and customized using a freezer paper stencil. As the mother of three girls, I've become acutely aware of the messages our culture sends to young girls, and I work hard to make sure they get lots of positive messages about women in our home. I refrain from any negative body talk about myself, my girls, or other women, and I try to educate them on all the amazing women that have made history. This shirt is a nod to some of those women. It's also sort of a wish for the future- that the names of amazing women that have made history can become so well known that we recognize them immediately- that when we hear the name Eleanor we think Roosevelt, when we hear Amelia we think Earhart. Kind of how we just say "Einstein"- the "Albert" isn't necessary to explain who it is. 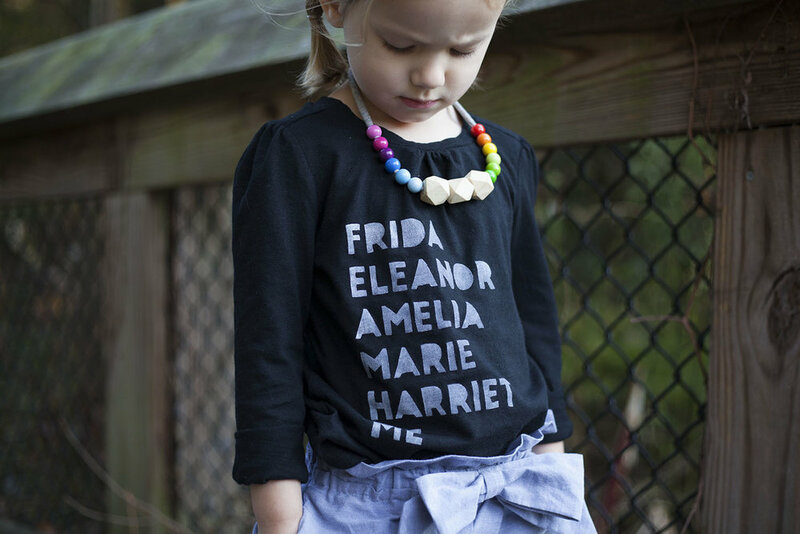 I'd love it if the names of influential female women were household names, and I hope that by educating my girls and making these clever (if I do say so myself) shirts, they can become well known to them. And of course, I couldn't help but add the "me" at the end- I want my girls to know they are brave and capable, too! For those who aren't familiar with freezer paper stencils, it is an easy and cheap way to put graphics on fabric. Freezer paper can be purchased at grocery stores and has a thin plastic coating on one side. When you iron that side to fabric it forms a seal, allowing you to paint any areas that have been cut away. There are loads of tutorials on freezer paper stenciling, but I'm including a brief tutorial and a few photos below, along with some tips I've learned! You can click the photos to enlarge. I've included a few affiliate links to the products I used below. Cut your design out of the freezer paper with an xacto knife on a self healing mat. Be careful to cut precisely. Any extra cuts will allow the paint through and make the design appear messy. I used an xacto knife similar to this one and love the swivel capability! Iron the paper onto the fabric, shiny side down. Use the highest heat your fabric can handle and no steam. Take care to iron over all the cut edges to make sure the paper adheres properly. Forming a seal at the edges is what will make a crisp design. Place a piece of cardboard between the layers of the shirt to prevent paint bleeding through to the back. Using a stiff brush and just a little of your paint, gently brush the paint on to the fabric, moving from the cut edges toward the center. If you brush the paint toward the cut edges it can pool and clump. You should be pushing the paint into the fibers of the fabric rather than painting a thick layer. The paint will soften with repeat washing, but if you paint it on thick it will crack and stay stiff. Once you've finished painting and your paint is dry to the touch you can carefully peel your stencil away. After it has fully dried, heat set the paint. For the screen print ink I used this is done by covering with a cloth and iron on the appropriate heat for your fabric with no steam, for 3-5 min on each side. After that, it's ready to be worn! And for those who are still trying to figure out who each person is: Frida Kahlo, Eleanor Roosevelt, Amelia Earhart, Marie Curie, and Harriet Tubman (although it could also be for Harriet Beecher Stowe!). I had quite the time narrowing this list down- I'd love to hear who you think should be on the list! Thanks for reading- don't forget about all the fun still going on!